By the end of August most of us are sick of cucumbers – and some probably were a month or two before. Here’s a quick, lively salad you can throw together in less than five minutes (if you have the whipped goat cheese around, which you should). It makes for a cool, satisfying snack or side dish but you could also ramp it up into a meal with some flaked leftover salmon, Trader Joe’s incomparable smoked trout or shredded chicken. 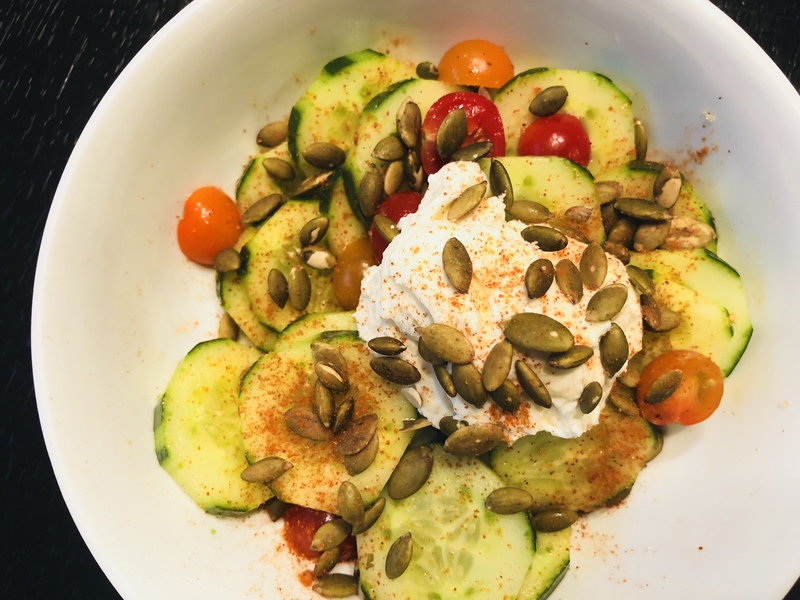 Place cucumbers and tomatoes in bowl and toss with salt and cayenne pepper. Top with whipped goat cheese (recipe below), toasted pepitas and herbs. Variations: A squeeze of lemon at the end would be fun, as would a drizzle of olive oil – perhaps both. Place all ingredients in food processor and blend until smooth. Use as dip for roasted cauliflower, chopped veggies, broiled salmon, whatever.